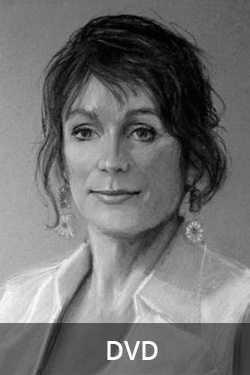 “This is an “alla prima” (i.e. 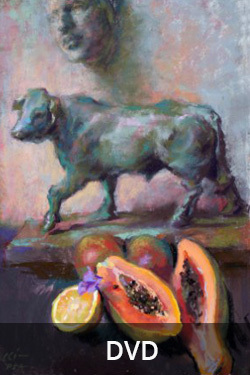 completed in one session) pastel painted en plein air. 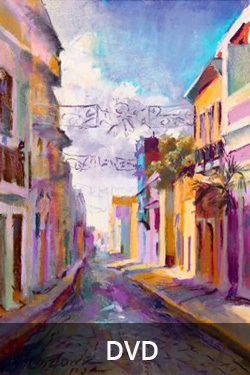 “The back door of the historic inn where we stay in Old San Juan opens onto this typical old street, Calle S. Sebastian. It is typical in, above all, being one of the streets with the blue cobblestones, as well as for the bright colors of the buildings. (The blue cobble stones were originally blue stone from England, used as ballast in English ships and then dumped to make room for the cargo for the return trips.) In December, when the intense heat has begun to moderate a little, the tropical colors and the Christmas lights strung overhead can be somewhat disorienting to a northerner while seducing one with charm. I knew at once I wanted to paint it. “We all paint according to our personalities. I love architecture, but my personality is not compatible with painting straight lines and stiff buildings with careful details like an architectural drawing. I like the way air shimmers and blurs detail and line, how it sharpens some edges and melts others. It does this by light and shadow and atmosphere. 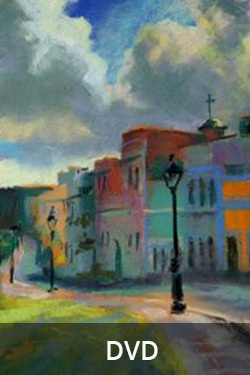 At the time of day when this was painted, one side of the street was in shadow and the other was mostly in sunlight, with some shadows being cast onto the sunny side. “It was a time of day when there were hardly any people out on the street. 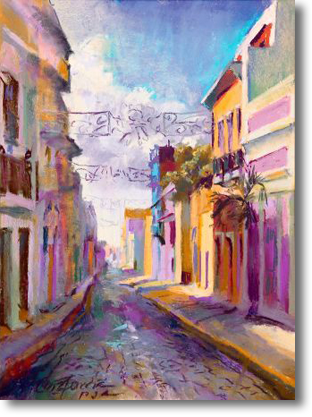 However, music and conversation and laughter came from some doorways and windows, and I had to beware of delivery trucks coming around the narrow corner where I set up my easel in the intersection – making the peacefulness of this scene somewhat inaccurate. Also, there were a lot of cars parked along the left of the street and I didn’t think they added anything to the scene, so I eliminated them. Artistic license! “I half-closed my eyes to get the light and shadow pattern and then painted like a house afire, abstracting the buildings as they went into the distance. Details, such as windows, balconies, the textures of the cobblestones, and the lacy Christmas decorations, were added at the end.